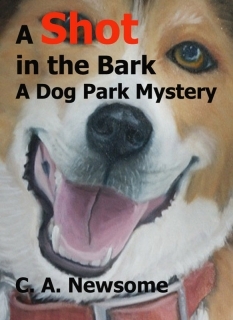 Carol Newsome is the author of A Shot in the Bark (A Dog Park Mystery). Here she discusses her unique book and how important it is for new writers to make a great first impression. It’s about an artist, Lia, who’s friends with a serial killer and doesn’t know it. When her writer boyfriend dies under suspicious circumstances, the dog park and its motley crew of denizens is the focus of the investigation. Of course the handsome detective, Peter, crushes madly on Lia. She’s struggling with questions about her relationship with the deceased. Secrets come to light in Peter’s pursuit of the truth, and that complicates things. And you’ve got this serial killer working to stay one step ahead of the investigation. I’m a big fan of mysteries. One thing I’ve noticed about our dog park is that people rendezvous in the parking lot and don’t think anyone is watching, but all of us doggie parents don’t have anything better to do than pay attention to who comes and goes, and speculate on what they’re up to. I’ve been saying for years that we needed to have a dog park mystery. So it was in the back of my head that this would be a fun thing to do. I was motivated to start my book after an acquaintance asked me to help him edit his thriller. There was a lot to like about the manuscript, but he was trying to write popular fiction, and he’s not a popular fiction kind of guy. He thinks it’s junk. He had a passive aggressive approach to feedback which showed up in his manuscript. What could have been a nifty book was turning into a mess. I wound up wanting to kill him. So I quit his project, picked up a pen and took him out. Sales have been steadily growing since I published in September. Right now I’m averaging 2 sales a day. Knock on wood. The only other thing I’ve published was an article I was asked to write about the Mapplethorpe exhibition in Cincinnati in 1990. Not because I had any great chops as a writer, but because I was in the middle of all the controversy, so a writer friend asked me to do it for a magazine she worked for in Dallas. But I’ve talked to a lot of people and been around writers, and the whole process strikes me as painful and tiresome, and even more difficult than being an artist (which I have been for more than 30 years). As an artist I’ve preferred non-traditional forms of exhibiting my work. Self publishing was a no-brainer for me. I like it a lot. It’s unbelievable that it’s now possible to publish a book with absolutely no money out of pocket. It’s very empowering. I get this little thrill every time I check sales and see the number has gone up. My biggest marketing strategy was to include some of the regular dog park denizens in my cast of characters, and talking to them about the plotting as I was writing. So there were other people invested in the book and talking it up and buying it as soon as it came out. They ask every day where sales are. I started a Facebook fan page, and had a virtual “launch party” which was basically inviting people to buy the book at a specified publication date & time. I haven’t done a lot with the fan page yet, but I expect that when I get further into the next book, I’ll be posting bits for people to read and comment on. I’ve been invited to give one talk and another is in the works. I’m also doing some blog interviews. Don’t know if they’ll boost sales, but it’ll be fun. I’m no expert, but from what I’ve read in the KDP forums, the most important thing I did was get those first twenty or so sales going, because then it started picking up momentum on its own. There’s so much support available in the KDP forums. That was unexpected. I wouldn’t have waited so long to write my book if I’d realized how easy it is to do this. Edit your book, then leave it for a month, and edit again. And again. Get a group of beta readers and give them a hard copy of your manuscript so they can write on it. Pay close attention to the feedback that pisses you off the most. Don’t fall so in love with your back story that you bog the book down with pieces of your imaginary world that add nothing to the book. And pay attention to pacing. Pacing is critical to keeping a reader invested. Oh, yeah, write what you like to read. That’s not marketing, but it needs to happen to keep the quality up. So my first piece of advice is don’t market an inferior product. As far as publishing goes, spend a week on your blurb and get it nice and tight. Get great cover. The cover has about half a second to grab a prospective buyer’s attention. The blurb has about 5 seconds or less to keep it. Once they click on “Look Inside”, your writing can sell itself, but it will never have the chance if your audience is turned off by amateurish presentation. Talk about your book. Beyond that, I’m still working it out. But the book will be around a long time, so there’s no rush. “Drool Baby” is the sequel. The title refers to Kita, a hound mix who constantly has long streamers of drool. Fun mysteries with a bit of romance, and a whole lot of dogs. “Like” the “A Shot in the Bark” fan page here. Better yet, go to Amazon and download a sample.